For the college vegetarian that has few options in the cafeteria, here is a recipe that you can whip up in no time! 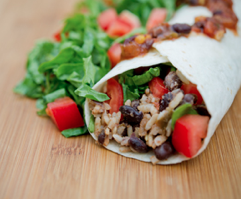 With all the essential nutrients you need without meat, this recipe is also perfect to take on the go. This meal is made with all fresh ingredients, so you can’t go wrong! Combine the black beans, salsa and rice in a saucepan and simmer gently for three minutes, stirring occasionally. Remove from heat, cover and let it sit for five minutes. In an ungreased skillet, heat a tortilla until warm and soft and then spread a line of the bean mixture down the center. Top with lettuce, tomato and more salsa, if desired. Roll the tortilla around the filling and then repeat with the remaining tortillas. Note: If you are partial to substitute meat products, you can include diced tofu or Morningstar Griller Recipe Crumblers to add more substance to the recipe. Great article Aspen! I've been a vegetarian for 7.5 years so I know how hard it is to be a vegetarian especially in college. I definitely have everything to make this including the Morningstar Griller Recipe Crumblers so I'll be making this real soon.